DLSU Bienvenido N. Santos Creative Writing Center and the UST Publishing House present the book launch of Loose Tongue. 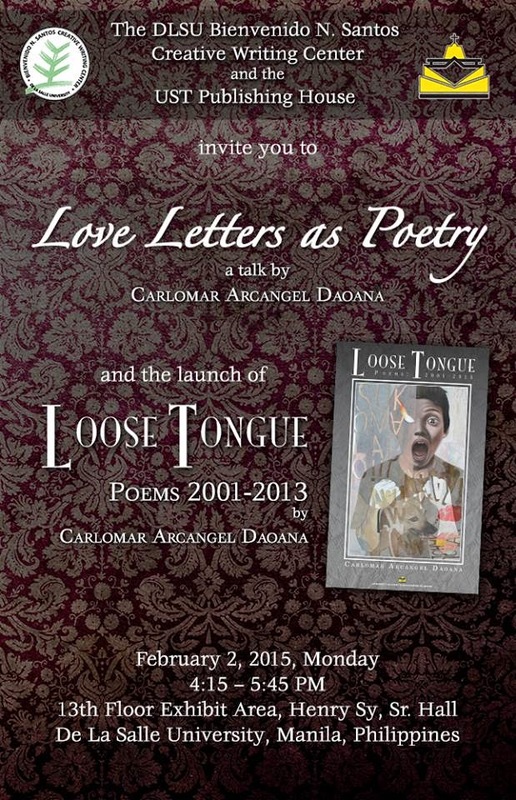 Poems: 2001-2013 by Carlomar Arcangel Daoana and his talk on "Love Letters as Poetry." This will be held on February 2, 2015, Monday (4:15 – 5:45 pm) at the 13th Floor Exhibit Area, Henry Sy Sr. Hall, De La Salle University in Manila. Event is open to the public. For inquiries, please call BNSCWC (632) 5244611 local 233 or email bnscwc@yahoo.com.